Winnerwell cook tent stove is an excellent choice for people who enjoy an evening snack or diner out in the woods. Staying home and cooking has become so boring for some people that they will go up hiking and cook themselves a delicious meal there. 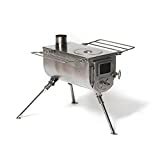 If you are a hiker but love homemade food this device is definitely for you, or maybe you enjoy an outdoor weekend brunch with your friends and family coupled with a few beers. Whatever your need may be, you can surely rely on this woodlander cook tent. Now you can always enjoy a nutritious meal and never feel to be too away from home. You can dump this in your car and head off to an unknown location in search of an adventure. You can climb mountains and swim seas with this, okay that might have been a little exaggeration but we promise you won’t be disappointed with this. Don’t believe us check out its features, pros, and cons before you decide. We know how important it is to have a companion with you and thus we will recommend this tent heater for you. This is an outdoor device that is designed for use in any kind of weather. It will deliver consistent and impressive results every time you use them. You can barbeque, boil water, fry, grill, in short, do everything you please to do with your hunt. Not only for you can also cook for your family of 4 or invite in a couple of friends for dinner. It can be used outside as a stand-alone wood-burner/cooker/fire, or inside a tent/cabin as the heating source. The best thing about this product is that you can choose from two different options depending on your needs as a consumer. You can either go for an m sized one or if you will you can also have an original woodlander one. The original woodlander makes it easier for the user to handle as it minimizes the heat radiation from the stove making it more user efficient. The m sized variant is also no less as it comes with a stainless steel body and it is rust or corrosion free, you can let it drench in the rain and its efficiency will remain unaltered. You get accessories like racks trays etc. You can either toss the product in a car or carry it by hand and take it where ever you go. The shipping weight is 21.4 pounds which is in comparison to other products in the market is quite light. You will also get a variant where you can buy black leather welding gloves and heat proof mat for quite cheap. We have been only talking about the outside uses, in fact, you can also use it inside a cabin or a tent without the fear of a potential fire or suffocation. The inside stove can be used all by itself without the outer stainless steel or the wooden covering. This device is well suited for family use, you can cook from single meals to preparing meals for up to 4 people. The insides of the stove is very easy to clean, you can always use any natural cleanser for the step. You can burn hardwood or aspen which will prevent in building up creosote in your stove and keep is as good as new. You can use a round brush to clean the pipes of the stove. The stove comes with its easy carry on the handle so that you can easily carry it by hand. It is a compact and modern design. It can control its internal combustion for all night long. the design is very sturdy and users have reported that they are impressed by the factor that it has such a well side rack functionality. The door of the stove opens all the way down and gives you enough space to work. It takes a very less time for you to setup this device as it comes with an easy manual guide. You have to clean the pipes of the stove by hand. A very brisk fire can burn out the pipes. You can not fit this device in the back of a small rv. If you do not use absolutely dry wood your stove might not work the best. You might have to buy separate brushes to clean off the stove and its exteriors. There is no as such warranty information provided by the manufacturer. Users have complained about the loss of shine and luster after heavy uses.